Direct current cardioversion is a low-risk and standard procedure to restore normal sinus rhythm in patients with tachyarrhythmias. It requires sedation to facilitate the procedure, as it is painful and distressful. The preferred anesthetic drug must be short acting, producing conscious sedation, to enable rapid recovery after the procedure. In this sense, this narrative review focuses on the critical analysis of recent randomized studies and presents about the safety and effectiveness of propofol, comparing it with other established sedatives, mainly etomidate and midazolam. The research was performed on MEDLINE database with Propofol and Cardioversion keywords. In most cases, propofol comes to be the best option, with a quick recovery time and low rates of side effects. Different studies have demonstrated no inferiority when comparing to other drugs and, when these adverse events happened, they were easily and quickly handled. Exceptions in this scenario are those patients, particularly the elderly, with baseline important structural heart disease, in which etomidate with fentanyl has been pointed to lead to better hemodynamic stability. Direct current (DC) cardioversion is a painful and distressful procedure that requires short-term general anesthesia to promote patient comfort. All available anesthetic drugs have some limitations for DC cardioversion, and no current guideline specifies which anesthetic drug should be used. Therefore, the following three main drugs are most commonly used for this procedure: midazolam, etomidate, and propofol. This narrative review focuses on the critical analysis of recent randomized studies to present an acknowledgment about the safety and effectiveness of propofol, comparing it with other established sedatives, for those who might perform DC cardioversion. Literature search for randomized studies was performed in the MEDLINE database. The PubMed search strategy included the following keywords: Propofol and Cardioversion. We also used the related articles' search strategy for each relevant article. We excluded studies with <20 patients from our review. The main purpose of this review was to evaluate the safety and efficacy in propofol usage compared to etomidate and midazolam. Therefore, we searched, when possible, for side parameters such as decrease in blood pressure, cardioversion efficacy, apnea episodes, pain on injection, recall, myoclonus, nausea, vomiting, and satisfaction with the procedure. A rapid onset and offset of anesthetic action, quickly inducing analgesia and loss of consciousness, and also a short elimination half-time, is desirable for a DC cardioversion. Besides, it should cause the minimum cardiovascular and respiratory side effects, such as negative inotropic effect for heart failure patients, and should not cause vomiting and nausea or accumulate if additional doses are necessary.,, In this sense, medications such as thiopentone, methohexital, diazepam, and inhaled anesthetic agents, such as isoflurane and sevoflurane, have already been used. However, none of these drugs could achieve all those qualities.,, Currently, the most used agents are propofol, etomidate, and midazolam due to their favorable pharmacokinetics and adverse effect profile. In hospitals in the United Kingdom, 90% of DC cardioversions are performed with propofol, followed by etomidate in 7%. Propofol is an alkylphenol that derives from 2,6-diisopropylphenol. It is administrated in emulsion that appears as a whitish opaque liquid due to the light dispersion caused by the very small droplets of fat. Propofol has the concentration of 1% or 2%, depending on the country., This substance can sedate by doing a positive modulation on the inhibitory function of GABAA receptors. Its favorable pharmacokinetics is the main reason why it is, in many countries, the most common intravenous nonopioid anesthetic drug used for induction of anesthesia. It is rapidly distributed and the duration of action ranges from 3 to 8 min, an interesting profile for procedures that require short-term general anesthesia like DC cardioversion. Propofol is mainly metabolized by the liver, but almost 30% of bolus dose is metabolized by extrahepatic metabolism, especially the lungs, giving it a high plasma clearance which is the reason for better recovery; after that, the metabolites have renal excretion, with a quick clinical recovery, despite its accumulation in the adipose tissue, [Table 1]. Propofol causes vasodilatations in both venous and arterial circulations, leading to the most relevant reduction of systemic blood pressure among all intravenous anesthetics. Another possible effect is a negative inotropic effect. The hypotensive effects are more likely to occur in elderly individuals with baseline structural heart disease. It can also lead to respiratory depression and apnea; likewise, it reduces the response to hypoxia and hypercapnia. However, by reducing upper airway reflexes, it gives a better intubation condition without the use of neuromuscular blocking agent.,, It also has a desirable antiemetic activity. Among randomized studies,,,,,,,,,,,,,,,, the outcomes investigated are heterogeneous. Furthermore, the doses and also the professional leading the anesthesia were different in many cases, which could have influenced their results [Table 2]. The main parameters that we sought to evaluate were the safety and efficacy in propofol usage compared to etomidate and midazolam. To evaluate safety, we took into account parameters such as blood pressure and the occurrence of respiratory events. To evaluate efficacy, we considered the time of sedation and recovery, as well as reports of pain during the procedure. Other side effects such as nausea and myoclonus were also considered. The majority of studies considered respiratory depression, apnea, need for intubation, or manual ventilation as respiratory events. They showed that all these drugs are equally safe, except for a study, in which more patients in the propofol group had apnea and needed artificial ventilation (15/20 vs. 6/20; P < 0.05). Some of these cases required manual ventilation followed by a quick recovery, and no intubation was necessary. In opposition, when fentanyl is added to propofol and etomidate, the occurrence of obstruction of the upper airway occurred two times more in the etomidate plus fentanyl group than in the propofol plus fentanyl group (P = 0.22), events that were quickly solved with jaw thrust and chin lift [Figure 1]. In order to evaluate the efficiency, we also considered the recovery time. Despite its subjective characteristic, some studies used known scores such as Aldrete, Ramsay, and Steward, while others did some other tests including the level of sedation, memory, comprehension, and collaboration, among others. These results were similar to those regarding the sedation time. Propofol showed to be superior to others, with a quick and better recovery. The usage of etomidate is also a good choice when recovery time needs to be short; it takes just a little longer than propofol. Midazolam, on the other hand, if not followed by flumazenil, can reach a recovery time of up to 60 min. Patients that recalled pain during the procedure were present in almost all of the studies, but with no significant difference between the groups [Figure 2]. In all of the studies, side effect criteria included pain during the injection, nausea, vomiting, and myoclonus. Etomidate presented the worst profile. The findings of pain during the injection were not consistent, but two of them reported that etomidate group had more cases of pain during the injection.,, Some studies used intravenous lignocaine prophylactically [Figure 3]. Propofol has anti-emetic properties that contribute to its favorable side effect profile, while etomidate showed the highest rates of nausea and vomiting. Besides that, etomidate causes a much higher incidence of myoclonus, which can reach up to 80% of the nonpremedicated patients,, with important interference in the electrocardiographic (ECG) signals. The incidence of myoclonus with etomidate is of 45% and, when fentanyl is added, the rate of this complication falls to 28% [Figure 4]. There are some points that deserve to be highlighted regarding the three main drugs used in DC cardioversion procedures. Midazolam is an effective anesthetic, encompassing hemodynamic stability along with a great side effect profile. Its main limitation is the increased recovery time in comparison with the other drugs, resulting in the necessity of a compulsory use of flumazenil. Compared to midazolam, etomidate presents to be a better option for most cases. Its recovery time is dramatically shorter, whereas the hemodynamic stability remains safe. Etomidate's disadvantage is its side effect profile, especially myoclonus that can interfere with the ECG interpretation. In most cases, propofol comes to be the best option. It has a quick recovery time and low rates of side effects. According to drug's mechanisms, hypotension and respiratory depression could be expected in several cases; however, different studies have demonstrated no inferiority when comparing to other drugs and, when these adverse events happened, they were easily and quickly handled. Exceptions in this scenario are those patients, particularly the elderly, with baseline important structural heart disease, in which etomidate with fentanyl has been pointed to lead better hemodynamic stability. The main limitation of this review is the limited number of randomized trials investigating the best anesthetic drug for elective DC cardioversion. Furthermore, the studies encountered are heterogeneous, had a small sample size, investigated different outcomes, used different drug doses, and had different professionals leading the anesthesia. 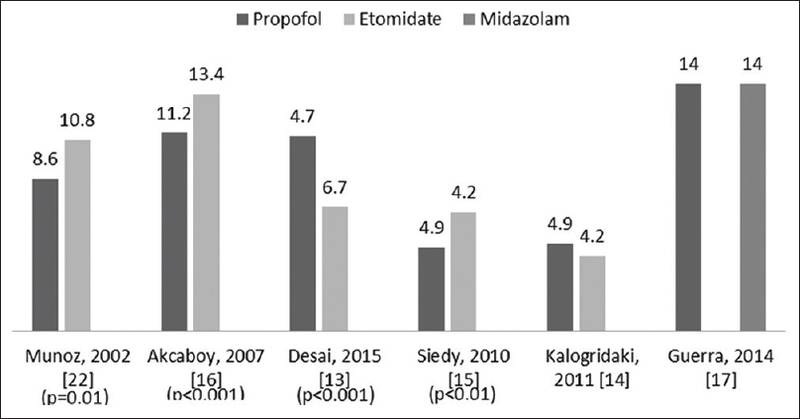 A future large randomized clinical trial comparing directly propofol with other most administrated drugs, such as etomidate and midazolam, would be interesting to establish the exact role of each sedative. Until then, the current choice must be individualized based on the clinical aspects of the patient and on the information obtained from the limited studies available. Zoll PM. Electric countershock for cardiac arrhythmias. Isr J Med Sci 1967;3:313-7. January CT, Wann LS, Alpert JS, Calkins H, Cigarroa JE, Cleveland JC Jr., et al. 2014 AHA/ACC/HRS guideline for the management of patients with atrial fibrillation: A report of the American College of Cardiology/American Heart Association task force on practice guidelines and the heart rhythm society. J Am Coll Cardiol 2014;64:e1-76. James S, Broome IJ. Anaesthesia for cardioversion. Anaesthesia 2003;58:291-2. Wood J, Ferguson C. Best evidence topic report. Procedural sedation for cardioversion. Emerg Med J 2006;23:932-4. Figueiredo E, Veloso HH, Paola AA, Invenstigadores de SOCESP. Initial energy for external electrical cardioversion of atrial fibrillation. Arq Bras Cardiol 2002;79:129-38. Maekawa T, Cho S, Takahashi S, Hara T, Tomiyasu S, Makita T, et al. Negative inotropic action of propofol is enhanced in the acute ischemic myocardium of dogs. J Anesth 2005;19:136-41. Miller RD, Eriksson LI, Fleisher LA, Wiener-Kronish JP, Cohen NH, Young WL, editors. Miller's Anesthesia. 8th ed. Philadelphia: Elsevier Saunders; 2015. Trapani G, Altomare C, Liso G, Sanna E, Biggio G. Propofol in anesthesia. Mechanism of action, structure-activity relationships, and drug delivery. Curr Med Chem 2000;7:249-71. Kaye P, Govier M. Procedural sedation with propofol for emergency DC cardioversion. Emerg Med J 2014;31:904-8. Lewis SR, Nicholson A, Reed SS, Kenth JJ, Alderson P, Smith AF, et al. Anaesthetic and sedative agents used for electrical cardioversion. Cochrane Database Syst Rev 2015;(3):CD010824. Herregods LL, Bossuyt GP, De Baerdemaeker LE, Moerman AT, Struys MM, Den Blauwen NM, et al. Ambulatory electrical external cardioversion with propofol or etomidate. J Clin Anesth 2003;15:91-6. Gupta A, Lennmarken C, Vegfors M, Tydén H. Anaesthesia for cardioversion. A comparison between propofol, thiopentone and midazolam. Anaesthesia 1990;45:872-5. Coll-Vinent B, Sala X, Fernández C, Bragulat E, Espinosa G, Miró O, et al. Sedation for cardioversion in the emergency department: Analysis of effectiveness in four protocols. Ann Emerg Med 2003;42:767-72. Kick O, Böhrer H, Motsch J, Kessler J, Conradi R, Martin E, et al. Etomidate versus propofol for anesthesia in ambulatory cardioversion. Anasthesiol Intensivmed Notfallmed Schmerzther 1996;31:288-92. Desai PM, Kane D, Sarkar MS. Cardioversion: What to choose? Etomidate or propofol. Ann Card Anaesth 2015;18:306-11. Kalogridaki M, Souvatzis X, Mavrakis HE, Kanoupakis EM, Panteli A, Kasotaki S, et al. Anaesthesia for cardioversion: A prospective randomised comparison of propofol and etomidate combined with fentanyl. Hellenic J Cardiol 2011;52:483-8. Siedy J, Knapik P, Saucha W, Gross M. Comparison of propofol and etomidate anaesthesia for elective electrical cardioversion. Kardiol Pol 2010;68:1249-55. Akcaboy ZN, Akcaboy EY, Altinoren B, Karabulut E, Gogus N. Adding remifentanil to propofol and etomidate in cardioversion anesthesia. Saudi Med J 2007;28:1550-4. Guerra F, Pavoni I, Romandini A, Baldetti L, Matassini MV, Brambatti M, et al. Feasibility of a cardiologist-only approach to sedation for electrical cardioversion of atrial fibrillation: A randomized, open-blinded, prospective study. Int J Cardiol 2014;176:930-5. Rahman NH, Hashim A. Is it safe to use propofol in the emergency department? A randomized controlled trial to compare propofol and midazolam. Int J Emerg Med 2010;3:105-13. Miner JR, Danahy M, Moch A, Biros M. Randomized clinical trial of etomidate versus propofol for procedural sedation in the emergency department. Ann Emerg Med 2007;49:15-22. Munoz Martinez T, Castedo Gonzalez JF, Castaneda Saiz A, Dudagoitia Otaolea JL, Poveda Hernandez Y, Iribarren Diarasarri S. Sedation for electrical cardioversion: A comparison of low doses of propofol and etomidate. Med Intensiva 2002;26:98-103. Parlak M, Parlak I, Erdur B, Ergin A, Sagiroglu E. Age effect on efficacy and side effects of two sedation and analgesia protocols on patients going through cardioversion: A randomized clinical trial. Acad Emerg Med 2006;13:493-9. Hullander RM, Leivers D, Wingler K. A comparison of propofol and etomidate for cardioversion. Anesth Analg 1993;77:690-4. Sternlo JE, Hägerdal M. Anaesthesia for cardioversion – Clinical experiences with propofol and thiopentone. Acta Anaesthesiol Scand 1991;35:606-8. Karthikeyan S, Balachandran S, Cort J, Cross MH, Parsloe M. Anaesthesia for cardioversion: A comparison of sevoflurane and propofol. Anaesthesia 2002;57:1114-9.